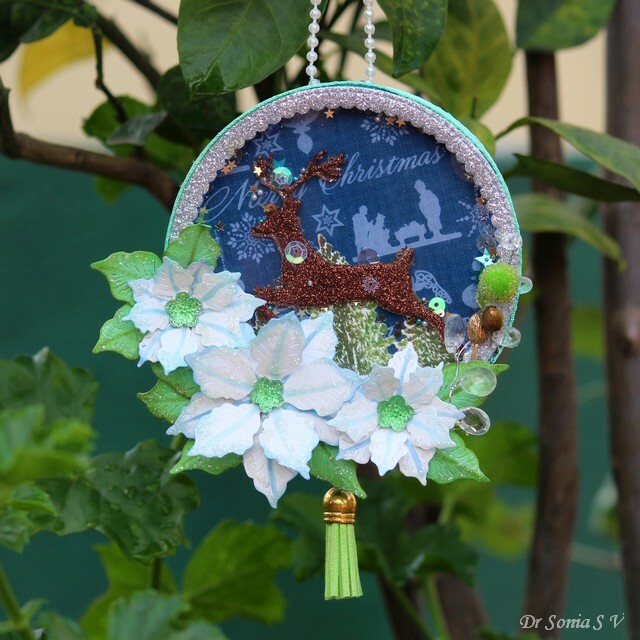 Hi friends, sharing a Christmas themed Shaker Ornament with a leaping deer on Chrismtas themed pattern paper and glittery handmade poinsettias. Shaker ornaments are such fabulous little pieces of home decor and would look lovely anywhere in your home and I think the would make cute handmade gifts too.Shakers are so much fun but time consuming to make and sometimes a bit tricky...sharing an easy way to make shakers which will save you time and help you churn up a dozen to gift or sell. 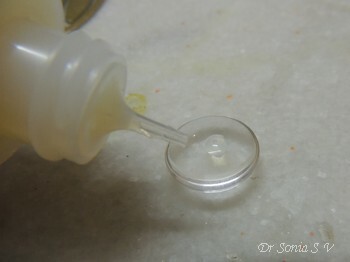 Glue - Good quality Glue which is not too runny and doesn't take ages to dry. 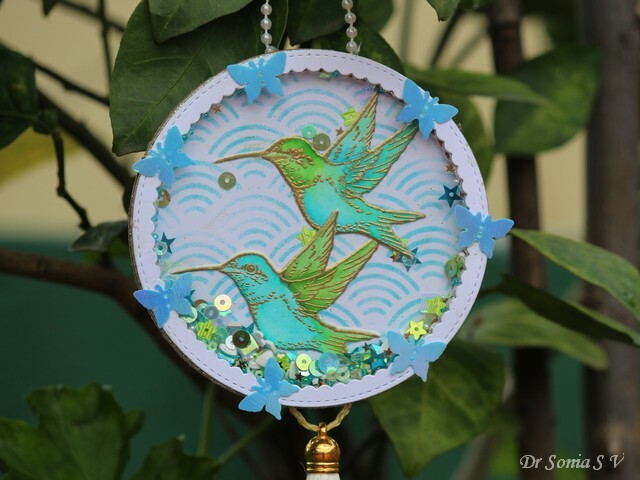 Use a circle/other shaped die to cut a sturdy base for your shaker ornament. 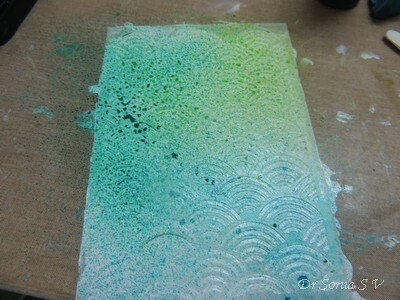 I layered pattern paper on thick card-stock and an additional layer of foam to form the base. 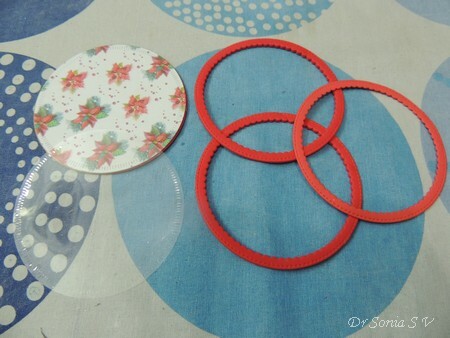 Cut the same sized circle from acetate also. Cut frames from craft foam. If you have thick craft foam you can quickly and easily build up the shaker using just 2 or 3 layers. 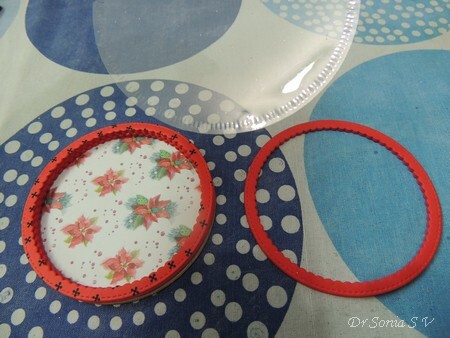 Dont use the glue gun but use thick good quality glue to stick the foam layers. [ used Aleene's fast grab tacky glue].Hot glue can leave strings and create uneven bumpy areas unless you are super precise and careful! 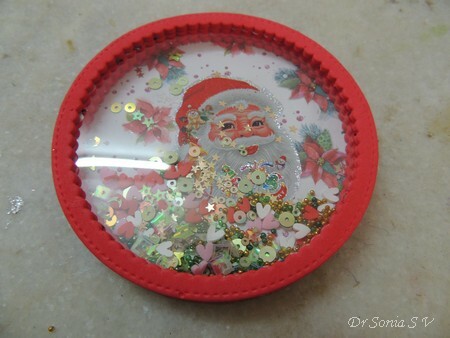 Tip : Allow time for the shaker well to dry nicely before you add the shaker elements as otherwise you will get sequins , beads and what not sticking to the glue on the sides. Once you have added your shaker elements, you can stick the acetate circle directly on the top foam frame and then add another foam /paper frame on top. Tip: If your shaker looks a bit uneven...put the whole shaker under a heavy book or box for some time and allow time for the glue to dry. Use the left over bits of inner foam to help stick the pearl strings/ tassels etc...Her you can happily use the hot glue gun. I hope you liked this simple Tutorial . 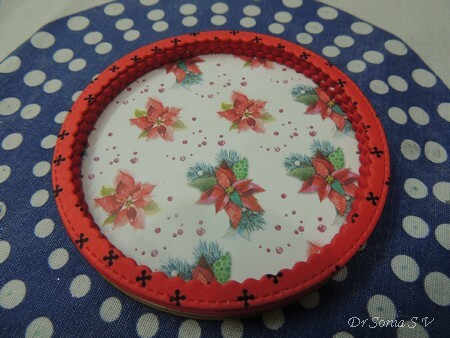 Don't forget to churn up a Christmas project for Maureen's Rudolph Days Challenge which runs from 25th to the end of this month. 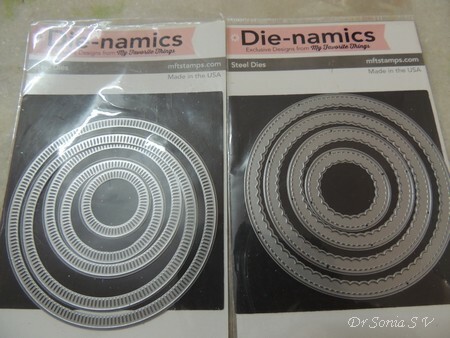 Supplies : Dies : Dienamics [MFT] Radial Stitched Circle Stax , Dienamics [MFT] Stitched Circle Scallop Frame,Memory Box Leaping Deer,Marianne Design Poinsettia LR0435. Hi friends...I am back to my usual style of crafting...floral cards with layers and lot of embellishments...even attempting the CAS style was challenging for me!! 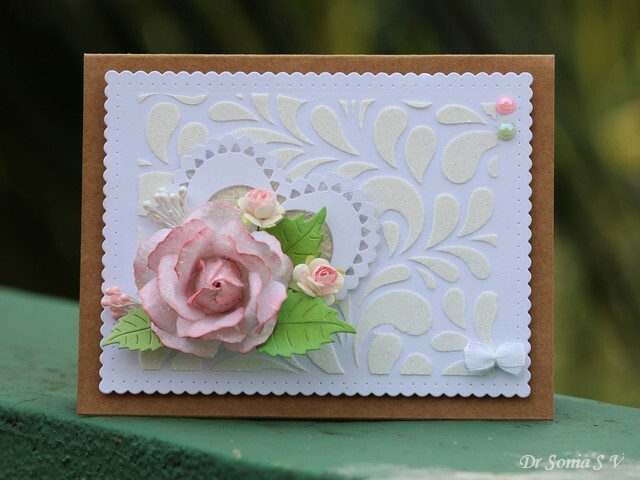 Though I confess this card did start out with the intention of making a CAS one! 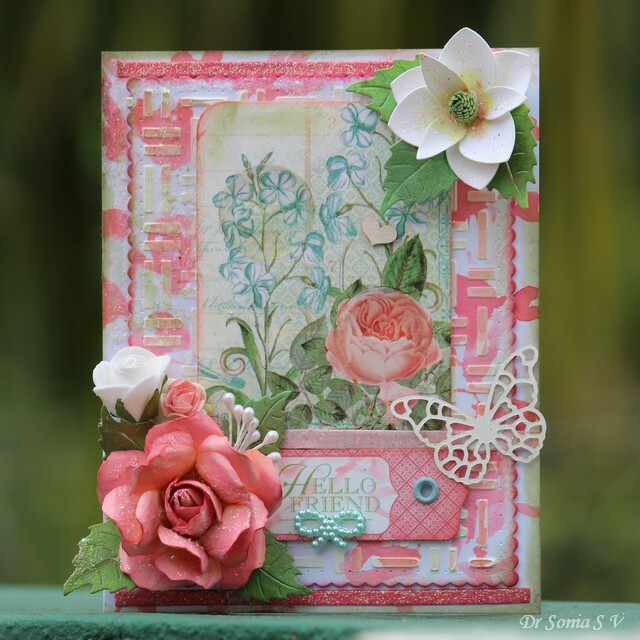 I wanted to use the gorgeous Graphic 45 floral image and created a stenciled textured and ink smooshed background for it. And I had to add my favorite Magnolia too! 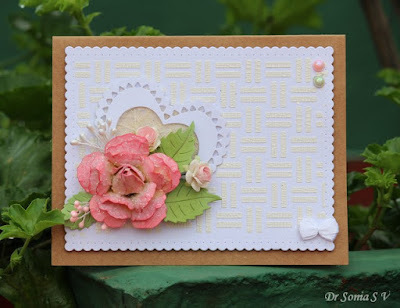 Supplies used to make the Card: Dies : Winnie and Walter Essentials Audrey Cutaways ,Spellbinders Curved Matting Basics, Spellbinders Rose Creations , Spellbinders Magnolia,Cheery Lynn Rose Leaf Strip,Memory Box Pippi Butterfly . 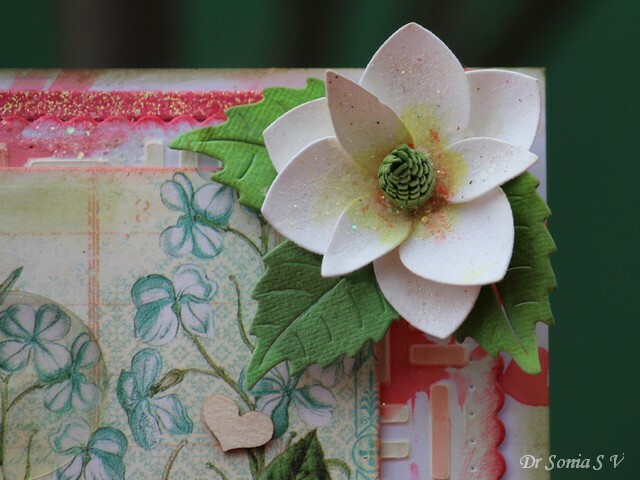 I made a matching tag featuring beautiful Graphic 45 papers and my favorite handmade Magnolia. 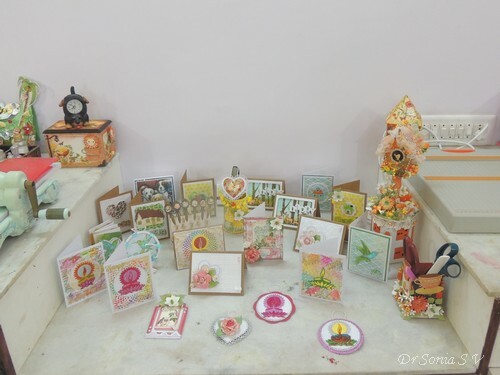 Here are some of the projects I made during the Winnie and Walter World Card Making Day Challenges. It's cloudy here in Bangalore so please forgive the dark picture of my craft table all tidied up for the "craftie"
Diwali is a colorful fun festival ! 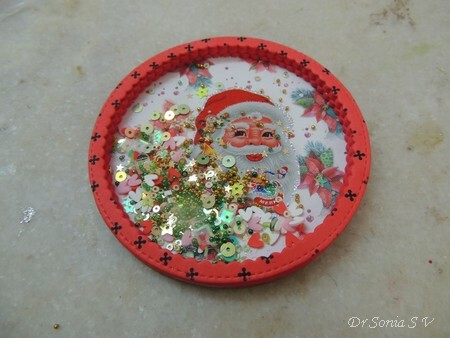 My daughter made this rainbow colored festive card using glitter foam . The background was made using rainbow colors of Zig Watercolor Brush Pens over the TCW Mini Solace stencil and smooshing Gansai Tambo Starry Gold over it. 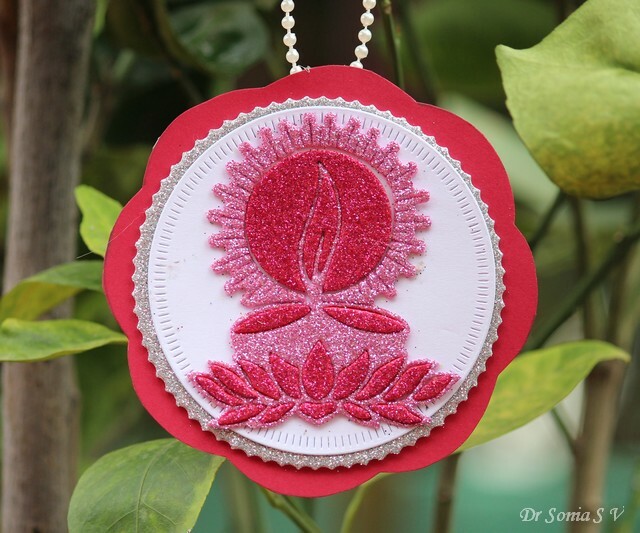 Here is the matching Diwali Decoration made using the negative from the diecut Diya used to make the card. 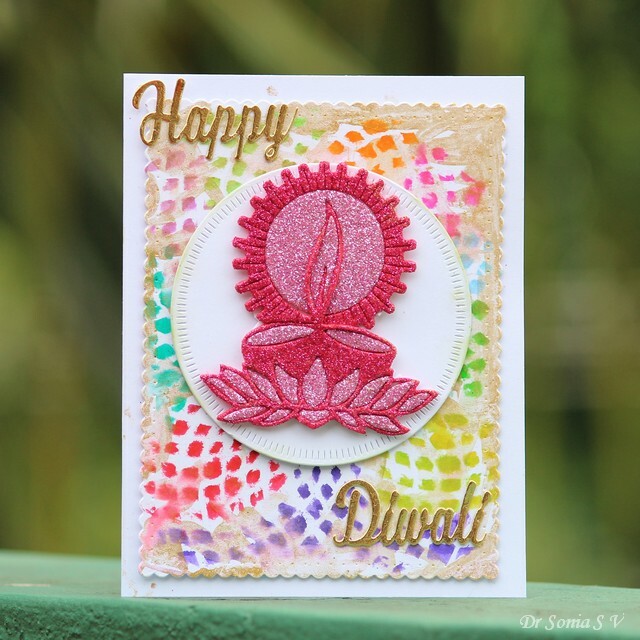 Sharing an easy Diwali card made by stenciling rainbow colors of Distress Inks through the TCW Mini Solace stencil and die cutting it using an MFT Circle die. Added a glitter foam Diya on it. 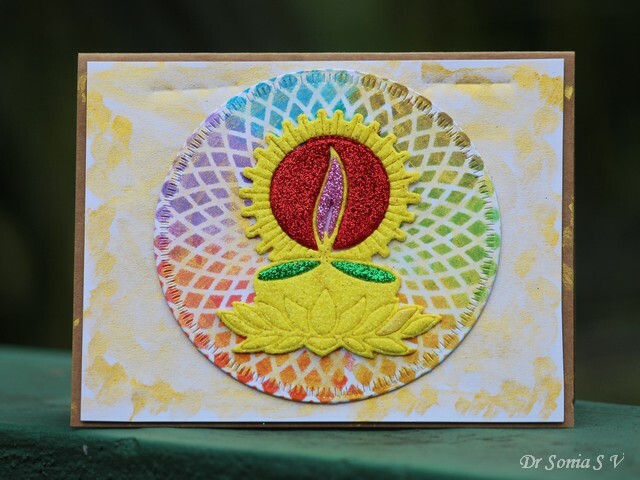 Layered it atop a background made by smooshing Gansai Tambi Starry gold onto white card stock. Sharing a Diwali Card made in rainbow colors! Made the background by stenciling texture paste through TCW Mini Solace stencil and once dried brushed Zig Watercolor Brush Pens in rainbow colors. Got the ink smooshed shimmery effect by smooshing Gansai Tambi Starry Gold on to it. 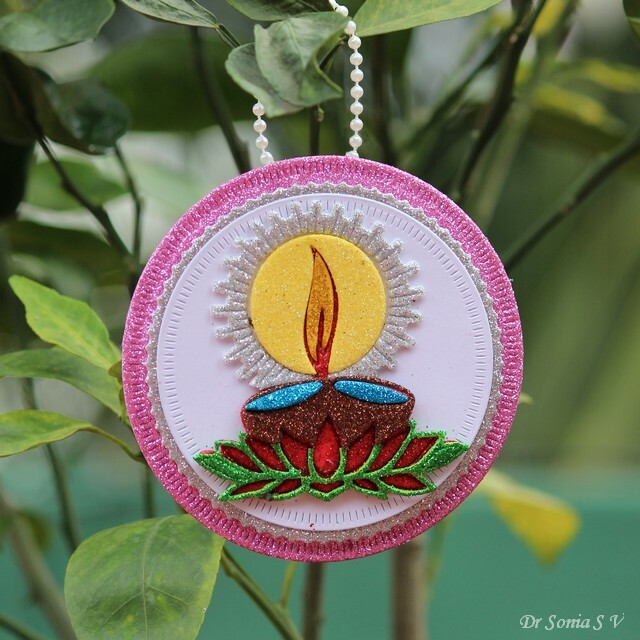 This week we will be celebrating our festival of lights called Diwali. 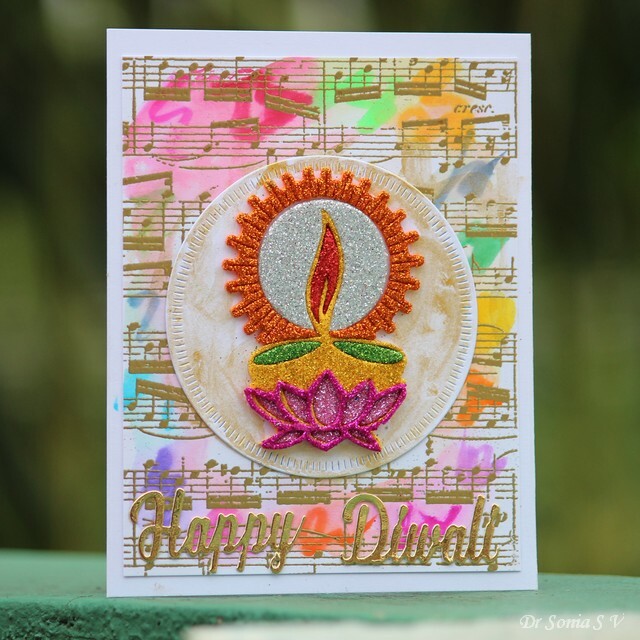 Here is a colorful card my daughter and I made! The background was created by heat embossing the Hero Arts musical background stamp in gold and used the Zig Watercolor Brush Pens to squiggle rainbow colors on it and smooshed water and Gansai Tambi starry colors on it! Hi friends if you are like me there will be at least some paper scraps you just cant bring yourself to throw! 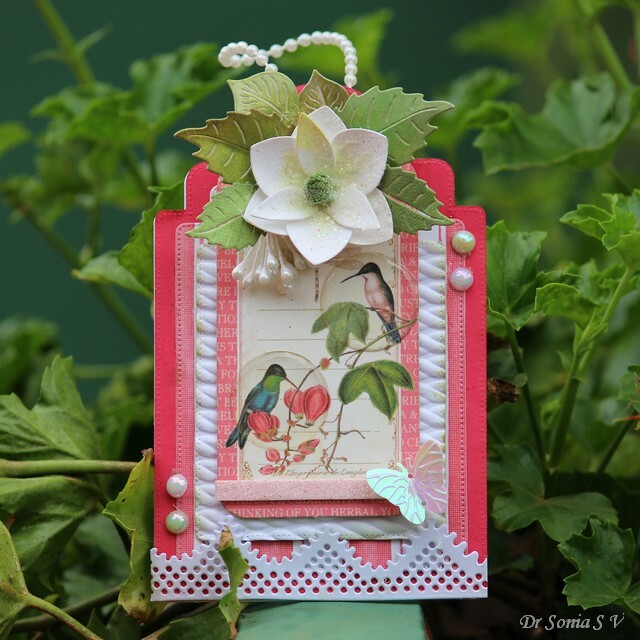 I just cant throw any pretty paper with images of butterflies and flowers and especially if it's paper like Graphic 45....all bits get hoarded! 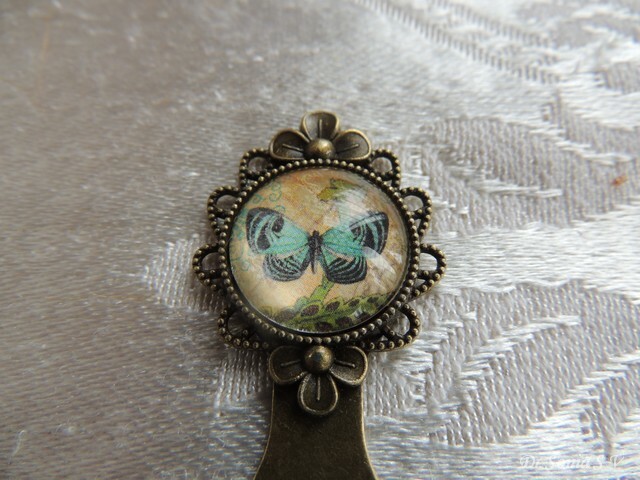 Using up scraps is a challenge especially the tiny bits. 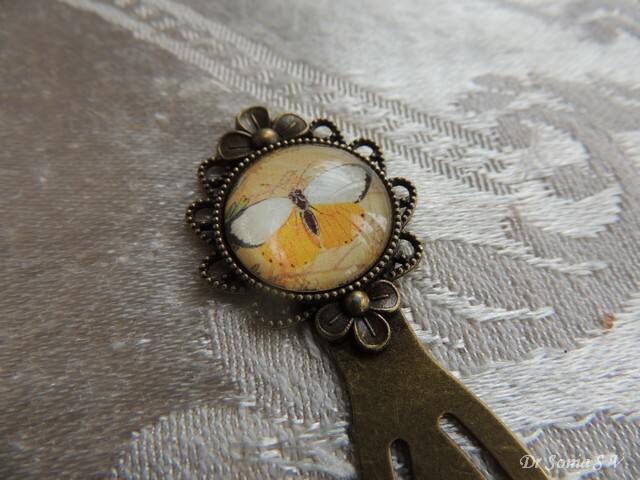 In this post I am sharing how you can use tiny teeny bits to create useful handmade metal bookmarks. Adhesive : an adhesive which dries clear and is super strong and wont yellow over time. 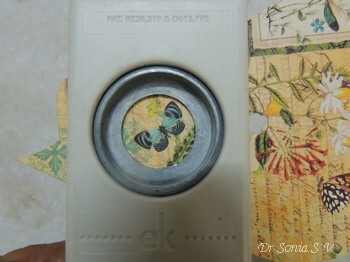 Cut out the image using a paper punch[ I am using an EK success 3/4th inch punch here]. Put the image upside down so that you can see exactly where you are cutting from the underside of the punch. 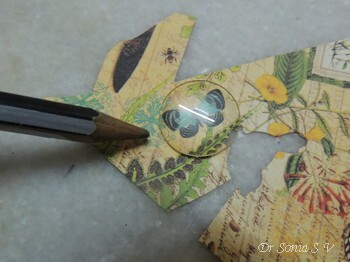 Alternately place the glass cabochon/disc on the image and trace the outline of the disc using a pencil and cut it out. 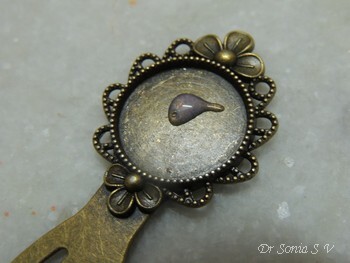 You don't have to be super accurate as the convex shape of the cabochon will hide minor jagged edges. 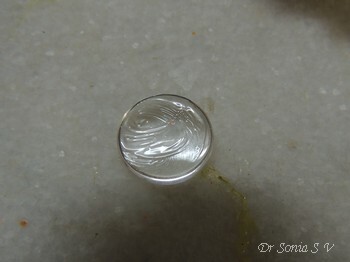 Apply a tiny bit of adhesive on the flat surface of the glass disc : I use glossy accent and find it is the best for this as only a tiny bit is required, it doesnt alter the color of the image, stick very well and fast and dries absolutely clear. 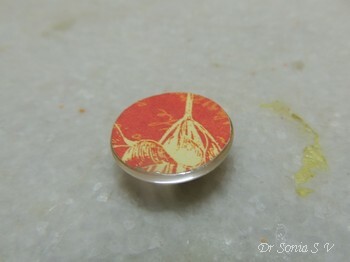 Stick your image so that the image side is on the glue. 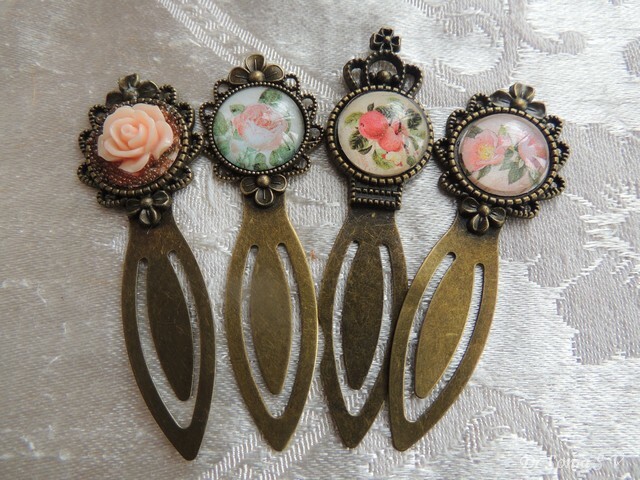 It dries almost instantly and you can use these cute glass discs on their own or go ahead and make bookmarks! Spread evenly making sure you have glue on the inner rim too. 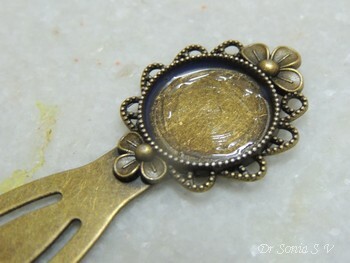 Stick the Cabochon and you are done...So easy and so beautiful !!! 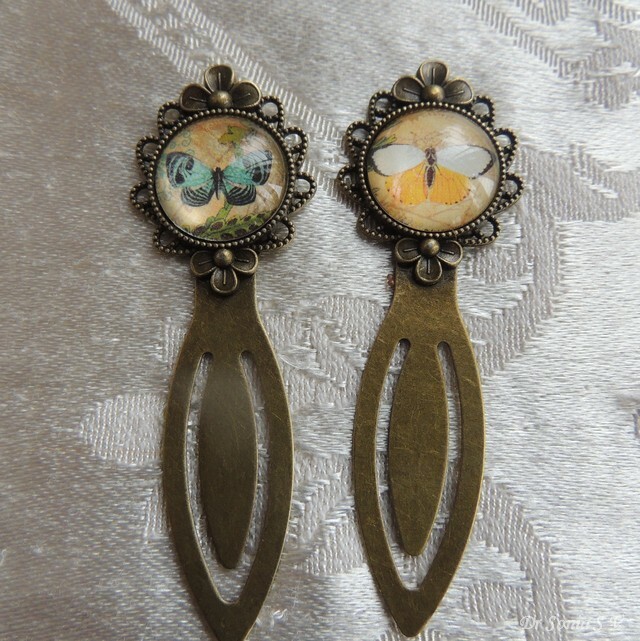 Here is another Graphic 45 butterfly . 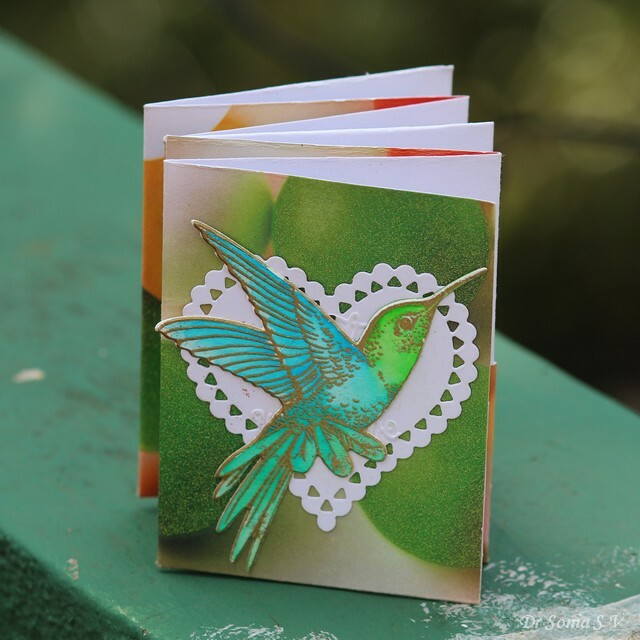 These metal bookmarks are so easy to make and will make awesome gifts .If you add a matching handmade card it will be just the perfect handmade gift set! 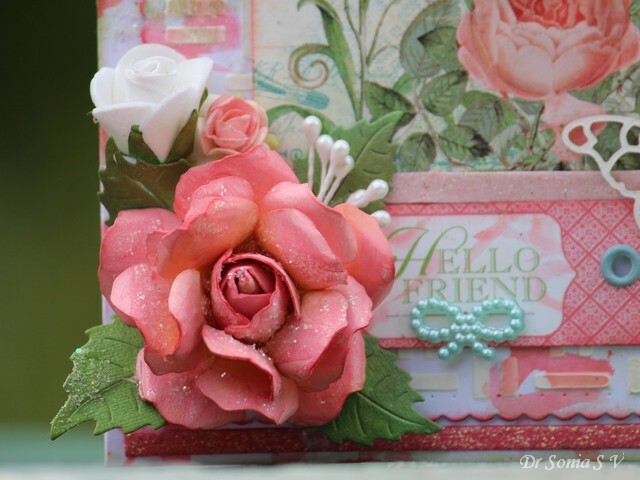 This card is a variation of this Rose Card shared earlier. 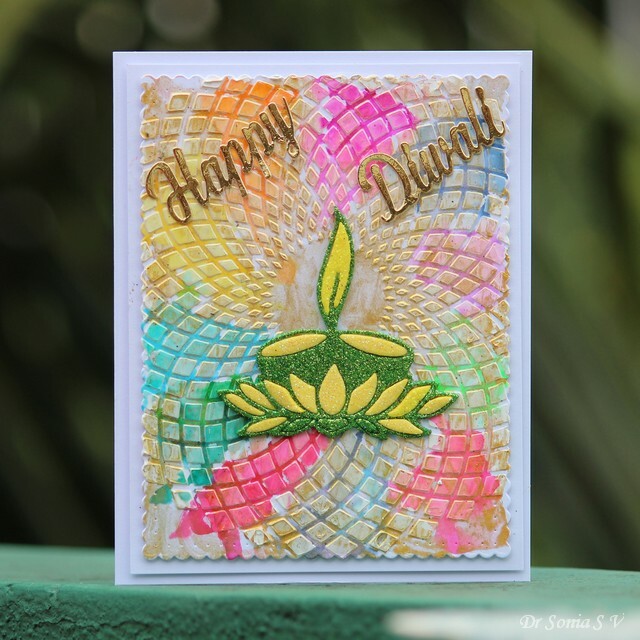 WCMD 2017 Background Building/Pattern Making Challenge with Mayuri - built the background using stencils and texturing media. 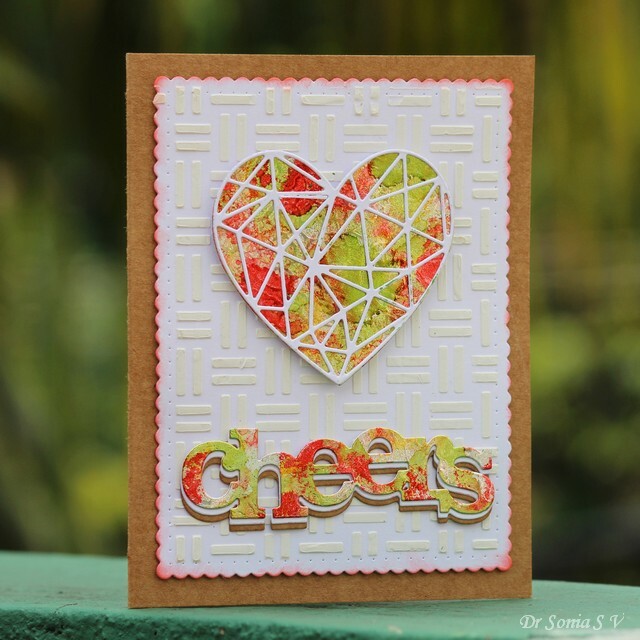 I love the look of the mosaic patterns alcohol ink gives ! Layered the cheers on white card stock and kraft paper staggering the layers to give a 3 D shadow effect. 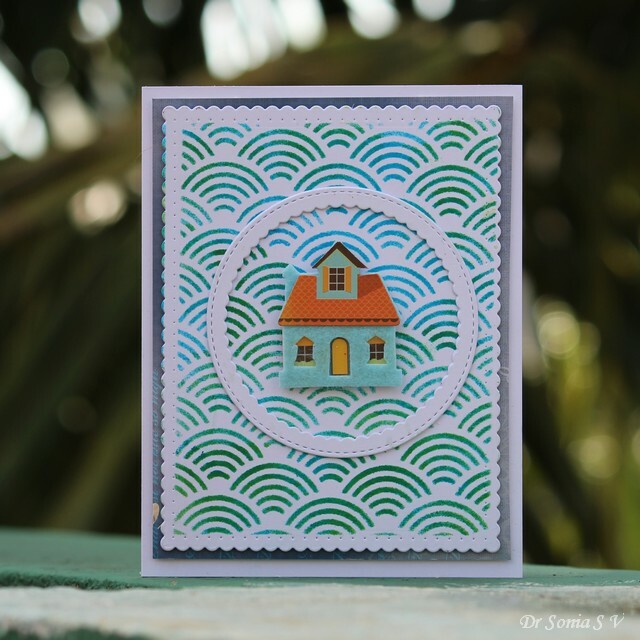 This card is a variation of the House Card shared earlier...I used the same design of a focal element with the cheers underneath it and layered atop the Winnie and Walter Essentials Audrey Cutaways die cut. 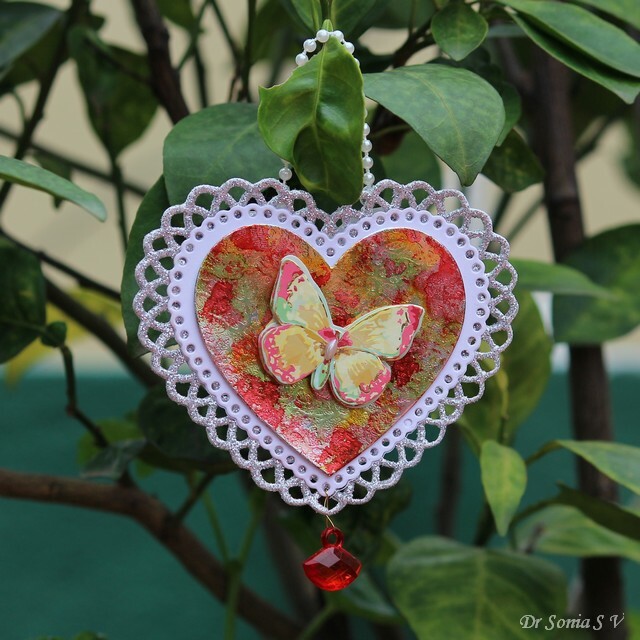 After making the card I had a bit of my Alcohol ink mosaic background so I cut it with the Winnie and Walter Flawless Heart Cutaway Die and layered it atop Spellbinders Lacey hearts die-cuts. 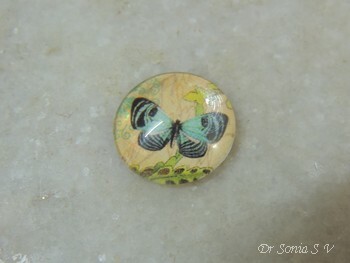 The gorgeous butterfly was a present from my blogger friend Priyanka Mathur. Hi friends sharing a card featuring a 3 D house which has tiny doors and windows and embossed walls and roof! It is one fiddly house to put together but looks gorgeous after all the work! 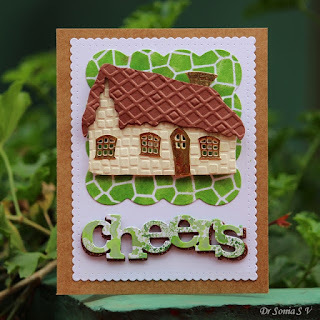 I created a green mosaic background for the house using Carabelle Studio Vitrail Stencil and mowed lawn Distress Ink, die cut it with a Spellbinders Scallop square die and used it to form the backdrop frame for the house. 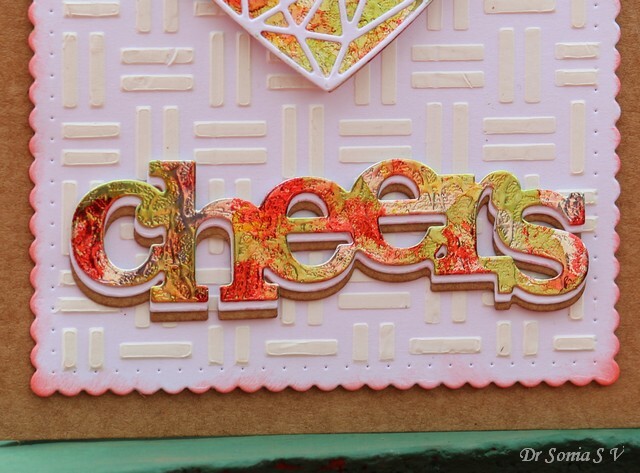 To create the "Cheers" I rubbed Mowed Lawn Distress Ink on my craft mat,spritzed water on it and gently smooshed my cheers die cut on to it....Love the effect I got! 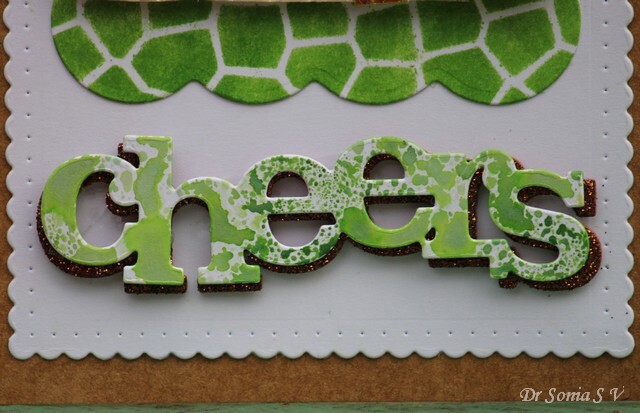 Layered it atop another cheers die-cut from brown glitter foam to make it pop! I had some leftover pieces of the green mosaic stenciled pattern and it was so lovely I didn't feel like throwing it away ! 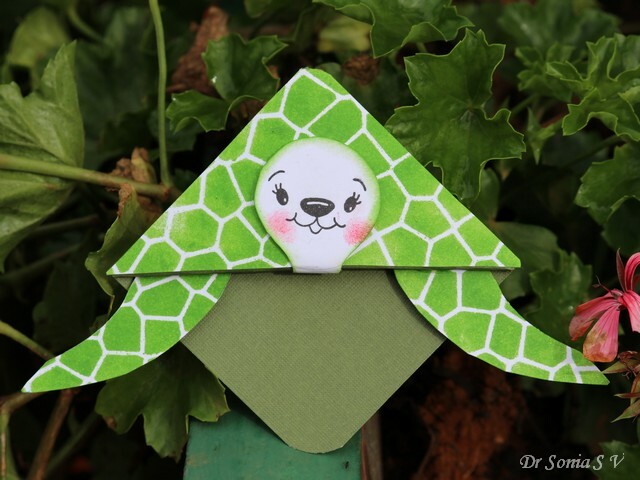 I used it to make a Turtle Corner Book Mark using Peachy Keene Stamps to make the cute turtle face. Hi friends Thank you for continuing to drop in despite my posting frequently! 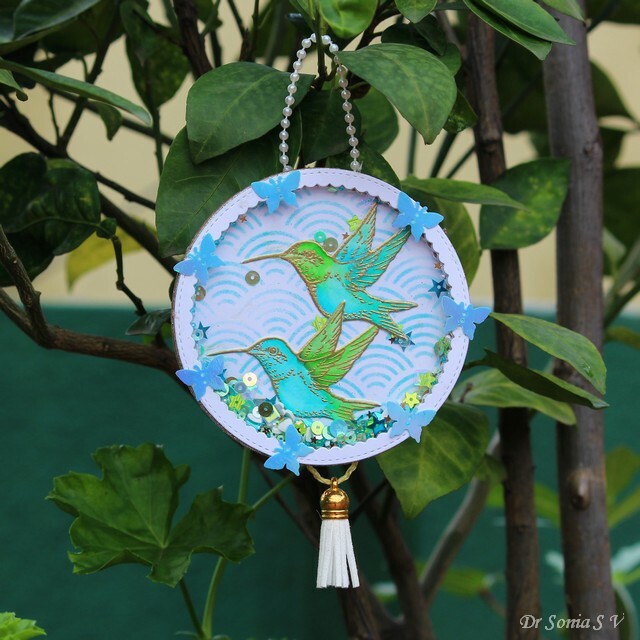 I am on a card making spree but it was so fun to make this decorative hanging ornament . 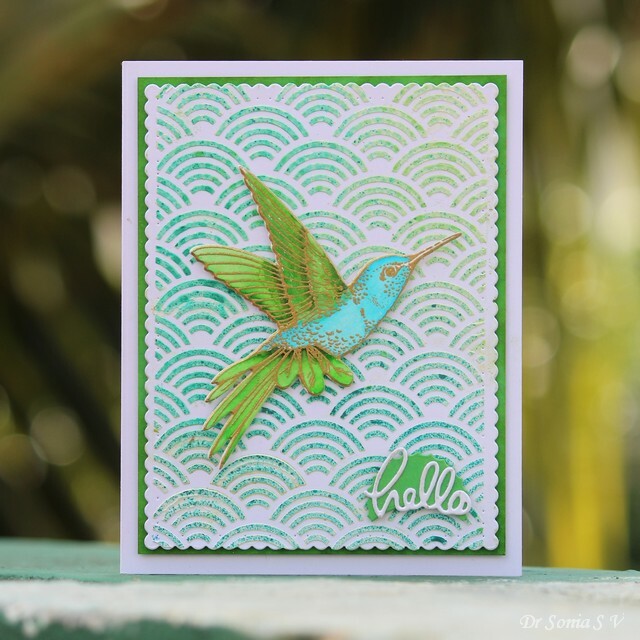 I made a stenciled background for my stamped hummingbirds and added blue and green glitter balls and sequins as shaker elements. 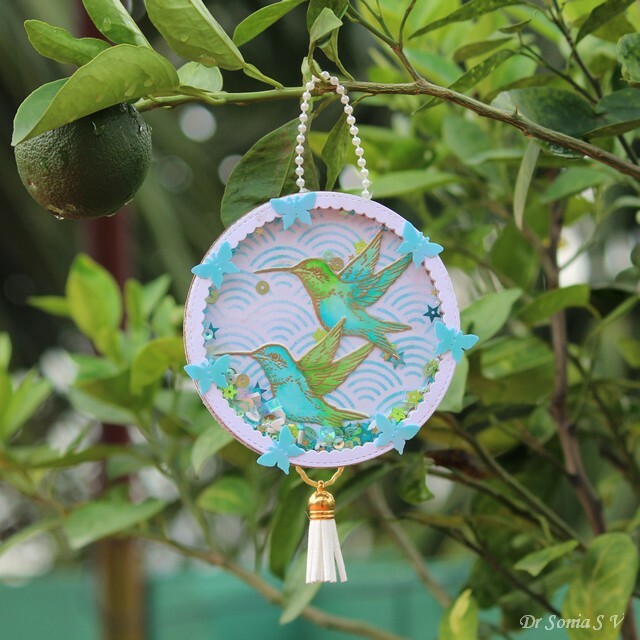 I confess this one actually started off as a simple tag but turned out to become a cute home decor project by the time I finished! 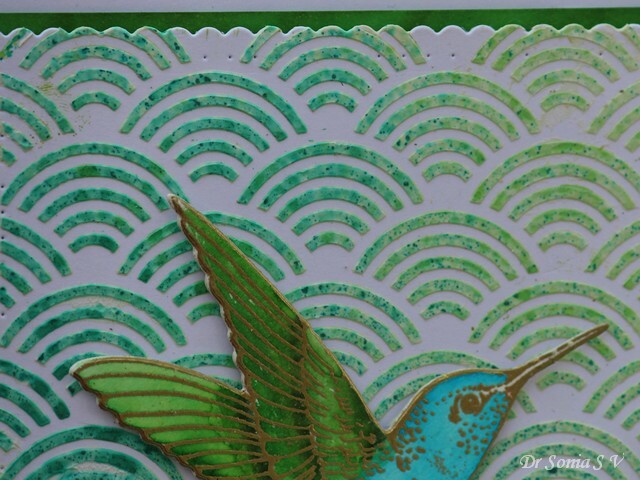 I made this simple stenciled card featuring a felt house as a variation of the Humming Bird Card shared earlier. 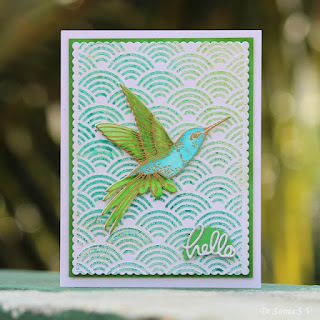 Hi friends sharing a simple card featuring a heat embossed hummingbird water- colored with Zig Brush Pens on a stenciled background . 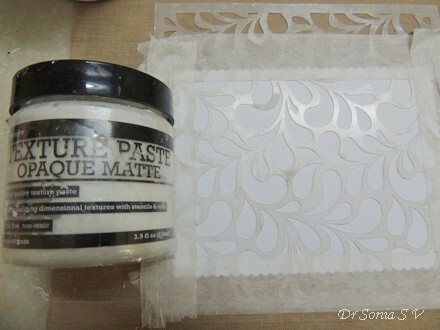 Here is how I made the background : Used texture paste on Carabelle Studio Geometrie 1 stencil and then sprayed different colors of Lindy's Stamp Gang sprays and gently smooshed the inks to blend them before lifting the stencil. Love the speckling and the mix of colors I got on the stenciled background ! Made a simple mini book to match the card.